Now heat oil in a cooker,add loung n patta fry for a minute. Later add onions sliced finely along with green chillies. Fry until light brown and then add ginger-garlic paste...n fry till the paste turns golden brown. Add the curry leaves,mutton bones along with salt,red chilli powder and turmeric powder. Also add the tomatoes cut finely. Add about 2 cups water and pressure cook for 12 mins. Add the ground dal to it along with Tamarind water. Add coriander leaves and let it boil. Finally add garam masala powder,some more salt to taste. U can also add lime juice if u want it to be more tangy. PREFFERED COMBINATION:Bagara khana-Sem ki phalli Gosht-Dalcha. 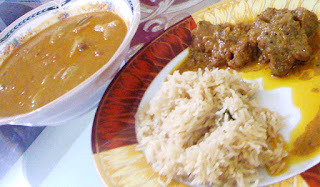 I made Dalcha with bagara khana and dum ka gosht .I have already posted Dum ka Murgh recipe on my blog but i tried with gosht instead of chicken...n its a superb combination to try ...hope u all will love this combination. Hmm, back with a bang! Dalcha with gosht and baghara khana is a superb combination that every Hyderabadi will definitely enjoy! so are you going to move to dubai permanently or you are just visiting,lets meet up when u are here, lemme knlow when u r coming i will give u my number. thanks, i am from hyderabad and my mom always cook this. Since i am in USA and learning cooking watching the desi website.. yours is superb and i am gonna cook now. When you say medium size, how many grams must it be? When you say 4 pieces of mutton, how many grams will that be? Hello Aseem, When i say medium size its about a ice cube size, and 4 pieces mutton can be about 100gms.They are approx 1inch pieces. hope this helps. Can you please tell me what is "Patta" in the ingredients? is there english name for it? Hii ,u know after marriage the dalcha I made using your recipe was the first dish which everyone loved. .. sooo it has become very special for me. .. Thank you for sharing the recipe. . Try adding a teaspoon of bojwar masala. Salam Anjum...thanks for sharing with us your yummy recipe collection. When you mention laung patta in your ingredients, do you mean cloves and tejpatta or dalchini shazeera? Would appreciate if you clarify. Thanks!